I finally joined the forums. I've been lurking around and decided to join. I picked up my new (to me) Solara recently. It's a 2008 silver sle 3.3 v6 hardtop with 11k miles. I've had numerous cars in past few years and decided getting this Solara was the best idea. So far, this car seems to be everything I could want in a vehicle... and more. I'm looking forward in getting a ton of insight through these forums. My future plans include a drop (a MUST - I don't care for the way it sits stock. A little too high for my liking). I'd also like new wheels and maybe a decent exhaust and sri. Welcome to SG! Feel free to post pictures or any questions you might have! Thanks! I'll have to take some pics soon. I have a set of Eibach's coming to me within the next few days. Anybody know where I can get them installed? Can I do the install myself...? YES. Do I have the tools, time, or patience...? NO. If anyone can help me out, I'm willing to pay - OR, recommend a decent shop here in Phoenix, AZ. I had my springs installed this weekend - looks GREAT in person. Anywho, just wanted to show a quick pic... enjoy. Your Lara looks great with the drop and 19"s.
Yeah i agree it looks clean, great job. I'll have to take a better pic. The rear and front are pretty much level (maybe slightly more that a finger gap). Should be perfect once I get 40 series tires. Clean 2nd gen....where in AZ are you located? Us AZ members are a rare group...as far as I know there is only one other person out here in AZ with modded solara and he's in gilbert I believe... I'm out in the west valley. 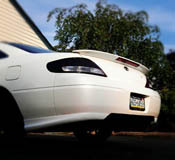 Which Eibach kit did you use? Did you do struts as well or just springs? Definitely liking the drop and wheels!